After three years of researching the concept of customer experience as an innovation design process, I unearthed many interesting things. The first thing I discovered is that in lieu of innovation, organizations create a hate vacuum? In other words, when we not willing to do the heavy lifting of inventing new exceptional experiences across the customer’s journey we simply default by developing punitive policies that proved to our customers that we hate them. This may sound like an exaggeration, but I found that the “no shoes, no shirt, no service” mentality to be alive and well across small, medium and large organizations. You will note in the mission statement in the photograph of this blog post that they don’t even mention the customer, they only mention their supplier the artist. I got news for you Art gallery your artist is not your customer, this may not sound profound but… your customer is your customer. Your organizational mission statement and the premise that you are there to serve your supplier is wrong and it will result in you developing punitive policies that make your customer hate you. This situation reminds me of a tourist beach town my family and I recently visited. In the swanky little beach town there is an outdoor shopping mall that not surprisingly included a gourmet ice cream shop. Once you purchased your delicious ice cream, you of course wanted to walk around and shop. This includes walking into shops with your ice cream. 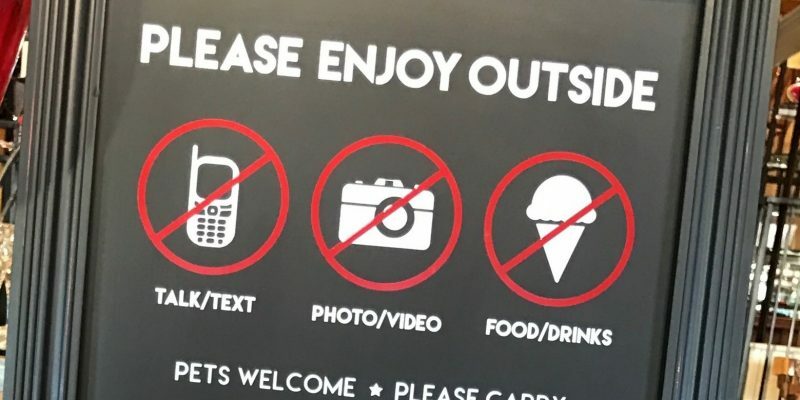 Virtually every store had a large sign that proclaimed “NO FOOD OR DRINK” for obvious reasons they wanted to protect their carpet from ice cream mishaps. After four or five stores we noticed a gift shop that had a large sign that said “FOOD AND ICE CREAM WELCOME!” not surprisingly the store was packed full of shoppers lined up at the cash register to buy items while consuming their ice cream cones. The other shops had great carpet…. and no customers! As you will see in the photo included in this post, you cannot talk, text, take photos, shoot video, drink or eat in their store. In the phenomenally competitive world of overpriced art, spanking the customer in a marquee at the front door is guaranteed to result in bankruptcy. Even in the best of cases it is extremely rare that a boutique art gallery can avoid financial peril. I observed this business for about 20 minutes and I literally watched half of the customers that started to enter their shop turn on their heels after reading the sign. The moral of the story is pretty obvious all organizations have customer punitive policies but in a time of hyper competition we need to revisit these policies to find ways to use innovation to eliminate their needs. Is there really a benefit to this shop by eliminating videos and pictures to protect the intellectual property of their artists? If someone was looking to replicate these items, frankly doubtful they can simply walk through and remember what the artist did. If they want to protect their floors – simply remove the carpet and put in tile. If customers talking on their cell phone offends them, get over it or find a new business. Let’s invent ways that honor and respect our customers and let’s have a ceremonial burial of the self-defeating policies that punish both us and our customers.